Here's a rundown of the likely chain of events after you call 911. Every 43 seconds, someone in the United States has a heart attack. If one day that someone is you or a loved one, it may be helpful to know what's likely to happen, both en route to the hospital and after you arrive. For starters, always call 911 to be transported via ambulance rather than going by car. Contrary to what you might assume, speed isn't the only rationale. "If you're having a heart attack, there are two reasons why you want to be in an ambulance," says Dr. Joshua Kosowsky, assistant professor of emergency medicine at Harvard Medical School. One is that in the unlikely event of cardiac arrest, the ambulance has the equipment and trained personnel to restart your heart. Cardiac arrest, which results from an electrical malfunction that stops the heart's pumping ability, is fatal without prompt treatment. However, most heart attacks do not cause cardiac arrest, Dr. Kosowsky stresses. "It's rare, but it's certainly not a risk you want to take while you're driving or riding in a car." 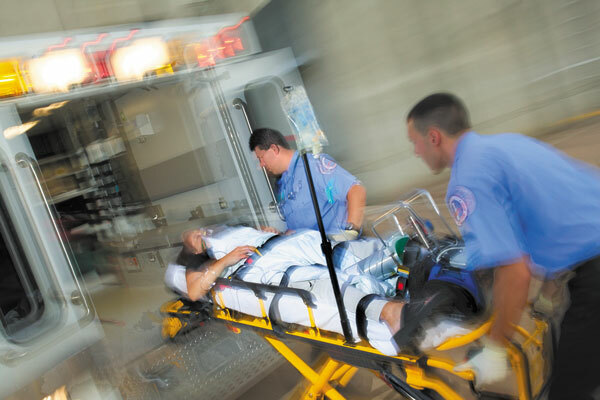 The other reason to travel via ambulance is that in many places in the United States, if a person calls 911 complaining of chest pain, the dispatcher will send paramedics who are trained to perform an electrocardiogram (ECG). This simple, painless test records your heart's electrical activity through 12 small electrodes placed on your chest, arms, and legs. A six-second recording can then be transmitted to the receiving emergency department, which can help speed up the process of getting you the care you need. Some people don't experience the typical symptom of crushing chest pain during a heart attack, however, so they may hesitate to call 911. People with pain that waxes and wanes or who have subtler symptoms (such as jaw pain or shortness of breath) may show up at the emergency room on their own. Even if you do this, you're still likely to get rapid care. The person who greets you might be a receptionist rather than a doctor or nurse, but most emergency departments follow a specific protocol for a suspected heart attack. "If you mention any symptom that sounds like it might be a heart attack, the first thing they'll do is to get you an ECG, ideally within 10 minutes of your arrival," says Dr. Kosowsky. A doctor then interprets the ECG, which will reveal if you're having a major heart attack, in which an artery feeding your heart is blocked, choking off the blood supply to part of your heart muscle. This usually creates a distinct signature on the ECG and means you'll quickly receive treatment to open the blocked artery. But not all heart attacks show up on the first ECG. So even if it looks normal, you're still not out of the woods, says Dr. Kosowsky. The next step is an evaluation by a doctor or other clinician, who will ask about your medical history and details about the location, duration, and intensity of your symptoms. You'll also have a blood test to measure troponin, a protein that rises in response to heart muscle damage. This blood test is very sensitive. But keep in mind that elevated levels don't always show up right away. That's why doctors sometimes have people stay for several hours to get a follow-up troponin measurement. Other possible tests include a chest x-ray to look for alternative causes of chest discomfort, such as pneumonia or heart failure. A doctor also might give you a trial of medication to see whether it relieves your symptoms, and additional ECGs may be performed over time. Often, if several troponin tests come back normal, the doctor may want to check your risk of a future heart attack with an exercise stress test. This test can reveal how your heart responds to the demands of increased blood flow needed during exercise. During a standard exercise test, you walk on a treadmill at progressively faster speeds, while trained staff monitors your heart's electrical activity, your heart rate, and your blood pressure. An imaging test may also be performed to quantify the degree of blood flow to the heart. One option is an echocardiogram, a noninvasive test that involves placing an ultrasound probe on your chest to create a moving image of your beating heart. Restricted blood flow in the heart's arteries changes the movement of the heart, which an experienced echocardiographer can detect. Another option is a nuclear perfusion test, which entails injecting a radioactive substance called a tracer into a vein. The tracer then travels through your blood to your heart. A special camera that records the radioactive particles emitted from the tracer circles around the heart, taking images from multiple angles. A computer then combines these images to create a detailed picture of the blood flow to the heart. In certain situations, if the source of your symptoms remains unclear, a physician might order a computed tomography angiography (CTA) scan. For this test, you receive an injection of a contrast dye into your arm or hand. The dye "lights up" in an image to reveal a three-dimensional view of your heart's arteries, courtesy of multiple rapid-fire x-rays taken during the scan. Sometimes, even after all the testing, doctors don't know for certain what's causing your chest pain. "If that's the case, it's still worth asking the doctor what his or her best guess is, because that will help you determine what next steps to take," says Dr. Kosowsky.